Thinking of subscribing to Greenleaf Music? Join us as a subscriber at Level 2 or 3 now and receive physical CD copies of Serial Sessions 2015 and New Sanctuary Trio. You'll also receive discounts and gain access to our Metamorphosis subscriber series and our entire catalog. There are a limited number of CDs available, so sign up today! 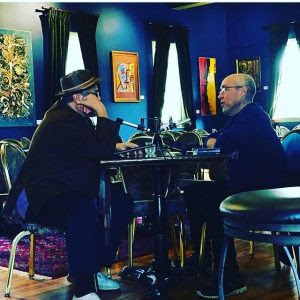 We've just release a new podcast featuring legendary saxophonist Joe Lovano talking to Dave about his many musical experiences and where he finds inspiration. Listen on our website as well as iTunes, Stitcher and Google Play. Our artists are busy making music on the road. This week Dave is in Bergamo, Italy Artistic Directing the Bergamo Jazz Festival. Rudy Royston also hits Bergamo on his current European tour. Next week the Greg Ward Quintet begins a tour of the US and Ryan Keberle & Catharsis tours Europe in April. Check out all our artist dates here.